Update: The Times has issued a correction. "An earlier version of this article and headline created an unfair impression about who was responsible for the purchase in question. 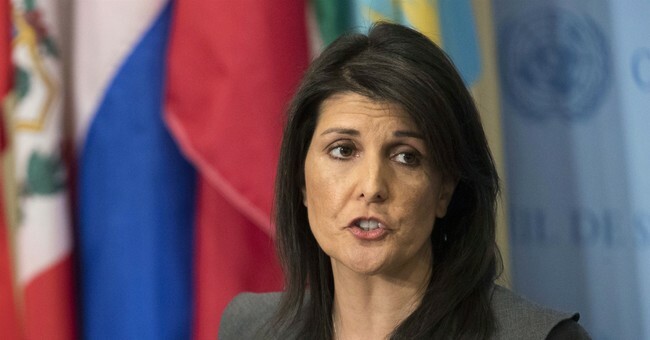 While Nikki R. Haley is the current ambassador to the United Nations, the decision on leasing the ambassador’s residence and purchasing the curtains was made during the Obama administration, according to current and former officials. The article should not have focused on Ms. Haley, nor should a picture of her have been used. The article and headline have now been edited to reflect those concerns, and the picture has been removed." Original Post: Nikki Haley, U.S. Ambassador to the United Nations, has come under fire over expensive curtains that were installed in her official residence given the State Department’s deep budget cuts and hiring freeze. There’s just one problem—the nearly $53,000 furnishing was approved under the Obama administration in 2016. The New York Times’s report on the curtains explains that Haley is the first ambassador to live in the nearly 6,000 square foot penthouse in Manhattan ever since the Waldorf Astoria, where her predecessors lived for decades, was purchased by a Chinese company. For security reasons, the new living situation was arranged. It wasn’t until the sixth paragraph, however, that the Times reported that Haley had nothing to do with the purchase, which was approved under the Obama administration. Patrick Kennedy, the State Department’s top management official during the Obama administration, told the Times that the purchase was necessary for security and official entertainment reasons. “All she’s got is a part-time maid, and the ability to open and close the curtains quickly is important,” Kennedy told the paper. Critics slammed Haley for the purchase, despite the fact that the Trump administration was not involved in the order. “When @nikkihaley's not busy rejecting the idea of universal human rights, she's busy spending $52,701 of US tax payer money on curtains for her residence. Milk the people, screw the world. Fine priorities you got there,” Andrew Stroehlein, Human Rights Watch’s European Media Director, said in a tweet. Others came to Haley’s defense.